Springtime films. As we head into the summer blockbuster time, we present spring “betterbuster” films. What is the difference with our films? 1) Fewer large explosions than most movies (or television shows or commercials). 2) Not everyone speaks English (and we have the subtitles to prove it). 3) We think people can act with their clothes on. 4) Gore and gratuitous violence — not a necessity. 5) You’ll still be thinking about the film on the next day. 6) Our concessions are affordable and delicious (which has nothing to do with our film selections, but we think food and saving money is important). So we open with a film name that will surely get some attention on the marquee! 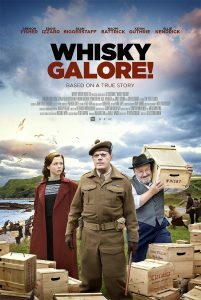 Whisky Galore is a remake of a 1949 film that was based on a novel by Sir Compton Mackenzie. It tells the true story (with dramatic license) of what happens in the tiny Scottish island of Todday when the SS Politician runs aground with 264,000 bottles of malt whisky. And, since war rationing has left the island dry, in a manner of speaking, the local folks’ desire to help this ship is great indeed. It is a comedy and a romance (and we note that while not all comedies are romances, some argue that all romances are comedies) with English comedian Eddie Izzard in the lead role as Captain Wagget, the officer responsible for making sure the whisky is accounted for. 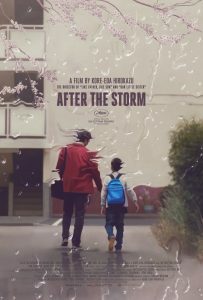 After the Storm brings us a film from a Japanese director popular in our office. Hirokazu Koreeda directed an office favorite, “Our Little Sister” as well as another film we liked and showed, “Still Walking.” Koreeda has the ability to present dramatic situations with a touch of humor, much like we (should) handle them in life. Hiroshi Abe (whom we saw in “Still Walking”) is a one-hit wonder author who spends his time making ends meet by working as a private detective, and making ends not meet by gambling. After his father dies, he realizes the importance of family and wants to reconnect with his young son, ex-wife, and his mother. Given his track record, he is not welcomed with open arms. But when he gets the chance to reconnect with his son, he does not want to let the opportunity slip by him. The trailer does a good job showing Koreeda’s mix of humor and drama. And, then we get serious. 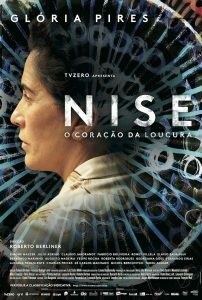 Nise: The Heart of Madness is based on the real-life story of Dr. Nise de Silveira. Her entire life is a lesson in battling the odds, including being the only female graduate in her medical class. She shows up in the 1940s to work at the Rio de Janeiro psychiatric hospital, where she is given little respect since she is a woman. Undaunted, she turns the psychiatric world upside down with her demand for and success with treating the mentally ill in humane way. This is not a documentary, but a dramatic telling of this one time in her life. But, after seeing it, you’ll want to learn the history of this doctor who is highly regarded in Brazil and beyond for her work. Hey, she even has a stamp with her picture, and for nerdy stamp collectors like me, that is high praise. Watch the trailer here. From there we go to another film featuring women fighting for some rights. However, this a bit more light! 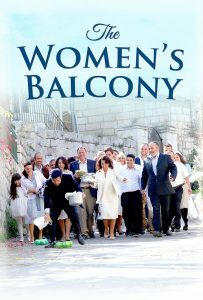 The Women’s Balcony is a comedy out of Israel where it has been a huge hit. A tragedy takes an Orthodox Jewish community’s rabbi out of the picture for a while. In his place a young rabbi with strong views shows up, and before we know it we have the classic battle of the sexes played out, complete with quotes for Jewish philosophers? A fast-moving, funny film — even the trailer works that way. You can read the press release, watch the trailers, or visit the Knick website (and we’ll be listing our Family Film Series and next One Night Only series soon).